Errol Flynn is credited with introducing rafting down the Rio Grande as a tourist activity. And it continues today; with very few changes from the original version. This was no white-knuckle white-water trip. Rather is was one the most relaxing days of my life. The rafting experience hasn’t changed much in the past 80 years. 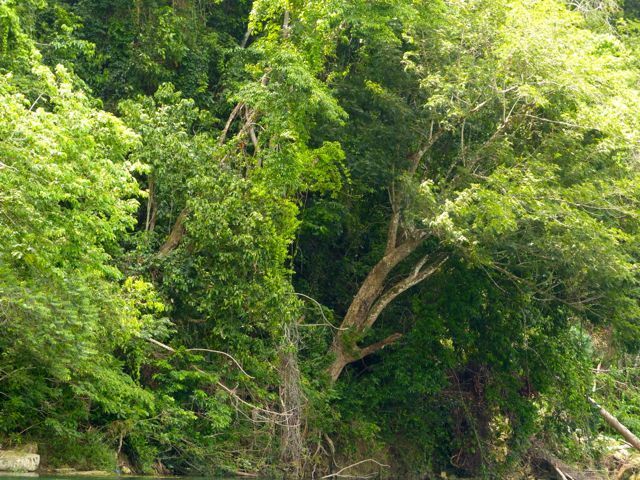 The rafts were originally built to transport bananas down the river. The story goes that at some point Errol Flynn jumped on a banana raft and asked the captain to take him down the river. Pete and Gayle on their raft. 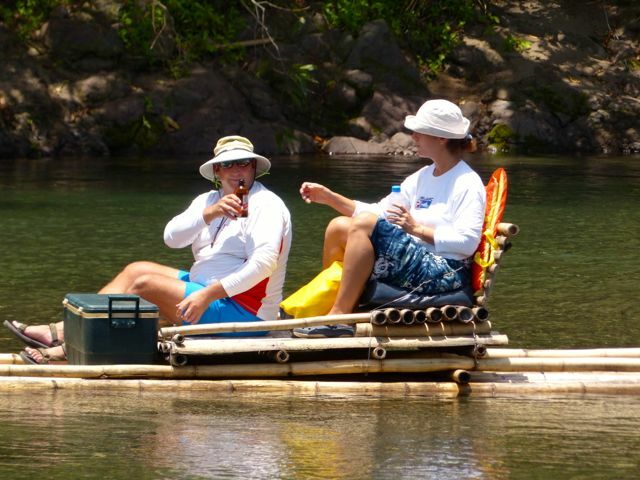 A close up of Pete and Gayle on their raft. Here’s the raft from our vantage point. The captain uses a long pole to punt the raft. 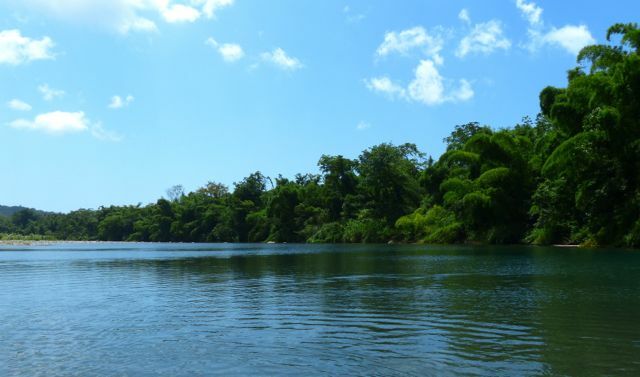 Because it is Jamaica, I was concerned that we would be hassled on our trip down the river. We met the beer and water vendor when we first started out but no one after that. To be polite, Tony bought some beer; we only had $10 and the vendor handed Tony a joint by way of change. 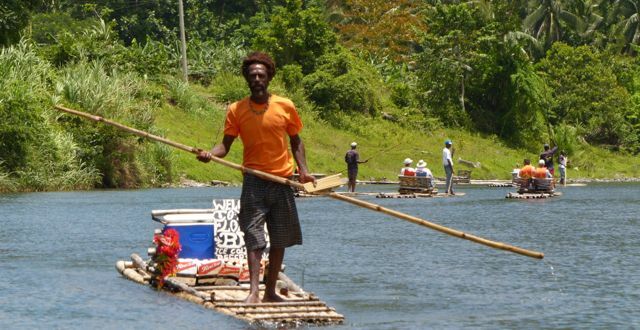 Here comes the cheerful beer vendor, punting his way upstream. The day was made even more fun because three other yachties, Tom, Christian, and Ozzie from Astahaya joined us. All the rafts (except for T&J’s). Ozzie had a raft to himself because we were an odd numbered group. Pete and Gayle had a chatty captain and they learned lots of interesting things. Like how long it takes to become a raft captain. 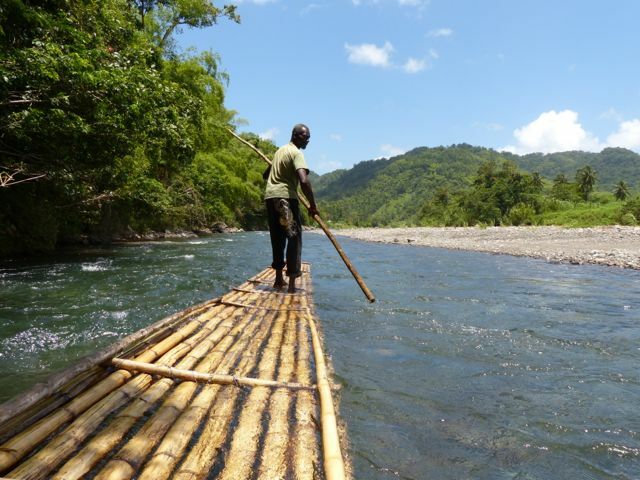 He started out with the job of taking the rafts back up the river, against the current. At first, it took him two days to get a raft back. Eventually, worked his way up to a raft of his own and now he pays others to take his raft upstream. Mike, Raft Captain No. 54. Each captain has his own punting style. It was fun to watch them all. These are the rapids. Not scarey. Jane and Tony shoot the rapids. I ascribe part of the perfection of the day to our two wonderful swim stops. I would have felt terribly sedentary and lazy had we sat for the whole trip. However, we enjoyed two delightful swim stops. The first one was a bend in the river with a little whirlpool. It reminded me of a fairground ride — into the stream and then pushed around the loop, back to the starting position, over and over again. All five of us laughing were laughing like kids. 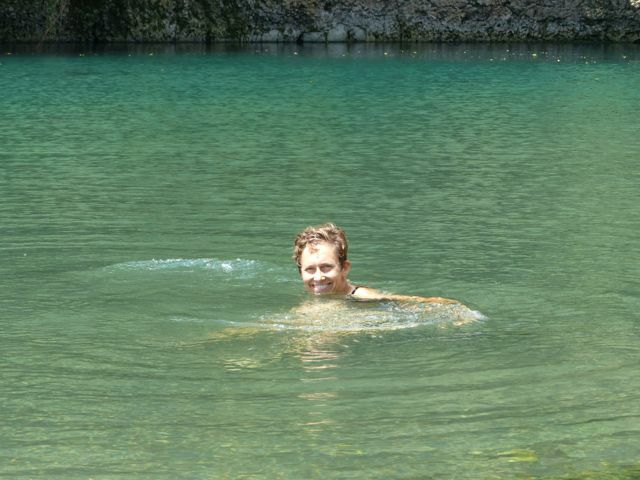 Jane enjoys the swim stop — extra nice to swim in fresh water. The scenery was spectacular, from beginning to end. I started out concerned that four hours would be too long a trip and concluded the trip wishing that it would never end. This entry was posted in Jamaica by Jane. Bookmark the permalink. Close up of Gayle and Pete- reaaaaaaaaally love it. That’s it! How did you get back to your starting point? OMG, that sounds sooo relaxing, from start to finish. Nice description, Jane – made it feel like I was there…and wish I were!